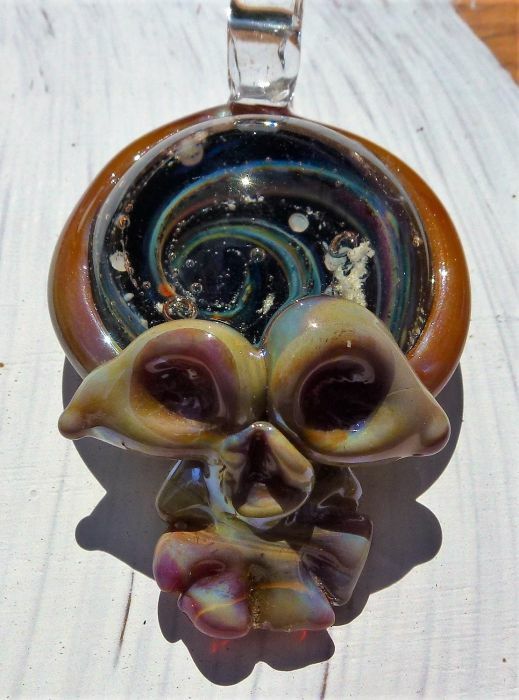 Rogan Glass Halloween Gift and Gothic page. The Halloween tradition originated from ‘Samhain’ which is a Pagan festival. The day is used to mark the end of Harvest Season and year end. During ‘Samhain’ it is thought that the ghosts of the dead would visit the mortal world. So bonfires would be lit in villages and lanterns put in windows to ward off evil spirits. Halloween is also known as ‘All Hallows Eve’ in some countries or the Day of the Dead in others. Halloween today is a day of celebration, costumes and childrens treats, discos, ghost stories, ghost walks, pranks and shenanigans. Please let my offerings to wear or display enhance your Halloween celebrations. 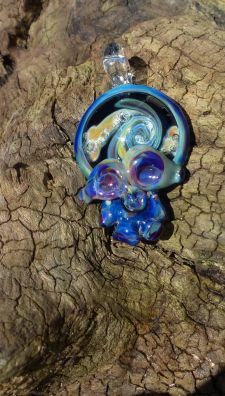 I make pendants of skulls, pumkins, ghosts and blown ghoulish heads with realistic eyes and spooky bauble sets of ghosts and reapers to hang up. Even blood droplets or even fanged pendants and not forgetting glass eyeballs.